This is a surname of Hebrew origins. Recorded in over twenty different spellings ranging from Aron, Aaron and Agron, to Aaronsohn, Aronovitch, and Aronowicz, it derives from the ancient given name of "Aharon", born by the brother of Moses, the first High Priest of the Israelites. The name is believed to translate as "a mounain of strength" or similar, although this is not accepted by all theologians, who believe that it may originally derive from a now lost Egyptian name. Be that as it may, after the 12th century a.d. "Crusades" to the Holy Land lead by the various Christian kings of the period, it became a popular practise for returning soldiers and pilgrims to call their children by biblical names, in honour of their fathers deeds. The result was that Hebrew names became Christian names and later surnames, and such names as Johan or John, Peter, Thomas, Isaac, and Adam, as examples, became the "standard " in European countries, and largely remain so today. Only from about the 15th century, and with a great increase in Jewish (Askenasic) refugees into Northern Europe, did Jews adopt or were given predominently "Hebrew" surnames. 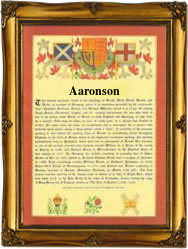 Early examples of this surname taken from the charters of the medieval period include: Stephan Aron of Bretten, Germany in the year 1490, and later Jacob Aaron, in the parish of St Mary Aldermary, City of London, England, in 1690.